The world is finally getting adjusted to the Instant Pot and now there is a new kitchen accessory on the market that is taking holiday wish lists by storm! The Ninja Foodi is the must-have kitchen item this holiday season! Is it really that great? Do you need one? Let me help you to learn all about the Ninja Foodi so you know if this kitchen accessory is a must for you! 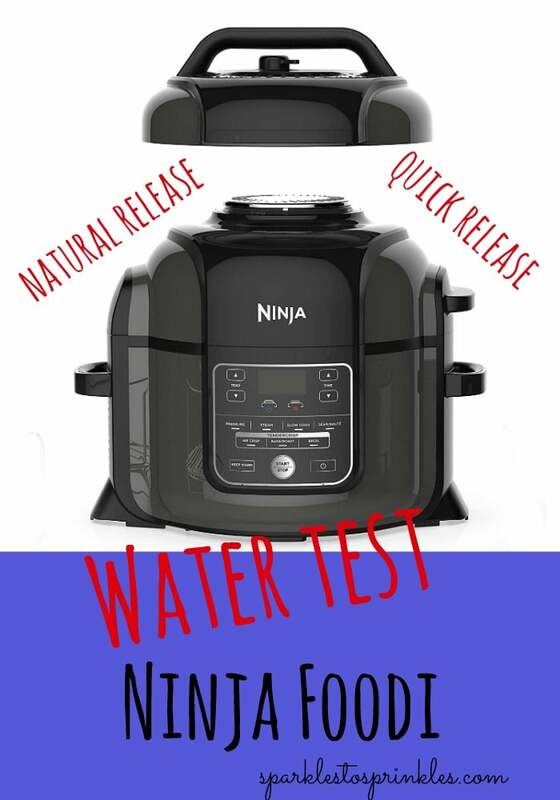 The Ninja Foodi is a multi-use kitchen appliance that pairs the features of an air fryer and Instant Pot in one. You are able to cook your food fast under high pressure with the pressure cooker feature, and then transition lids and crisp it up with the air fryer lid. So you can get that frozen steak cooked in minutes and then give it that crispy and crusty texture on the outside as if it came off a grill. Two separate lids! The one lid is for the electric pressure cooker, and the other is the air fryer lid. Both lids can be used in one single recipe, just after the pressure cooker is done, you take the pressure cooker lid off, seal on the air fryer lid and crisp up your food. This is saving people so much time because if you have a pressure cooker you know it cooks food fast but for that crispy texture, you have to toss in an oven to broil. Now, you don’t have to! This one machine does both! I will walk you through in my video on how I did my first water test. I shared tips and tricks on what to look for when you are working with your pressure cooker lid, ensuring you empty out the condensation holder and more. You can see first hand how easy this was to do and run my initial test. Don’t be afraid, I think if you give it a try you will love the Ninja Foodi for sure. Yes! Feel free to use just the air fryer lid or pressure cooker feature. You are not required to do both, but are welcome to! From crisping up some chicken tenders in the air fryer feature, or cooking a stew in a handful of minutes, the features work exceptionally well. The only downfall with this device is the air fryer lid does not fully remove. So when you go to use the pressure cooker feature the air fryer lid is still attached and just stands up, so you can seal the other lid. Some do complain about this, but it is something that can be overlooked. So let me share some prime examples of how magical and fantastic the Ninja Foodi is when it comes to preparing a meal for you and your family! Baked Mac and Cheese | So start out by cooking your macaroni and cheese in the pressure cooker feature. Once done switch over to the air fryer feature and get that crispy golden brown topping that you would get when baked. All of this can be done in this one appliance which saves dishes and time! Crispy Wings | Love a good chicken wing? Cook up your wings in a hurry again starting with pressure cooker feature. Then swap over to the air fryer to get that hot air circulating all around the wings and crisping them up as they came out of a deep fryer. Pair with your favorite dipping sauce and you have a dinner or appetizer fit for a king. Scalloped Potatoes | Who doesn’t love a cheesy and creamy scalloped potato? Cook up your potatoes to tenderness then do a quick final air fryer to crisp up the top for a slightly crispy texture. If you see from these samples, you will really get to utilize this device for sure in time. You can cook all types of food just like you would in your basic pressure cooker or how you would in your air fryer. Compare the two features and now you have even more endless possibilities. What do you think about the Ninja Foodi? Hello I have a question. I am new to the foodie and intimidated. When your recipie says cook 2 minutes stirring until the onion starts to soften? My question is what cycle is the foodi on? Do you use the pressure cooker lid for this? Thanks for your help. Tammy Browne.